In just a few days, the first total eclipse of the moon to be visible across the whole of North America since December of 2010 will occur. But to make the most of your moon-watching experience, there are some tips to keep in mind. 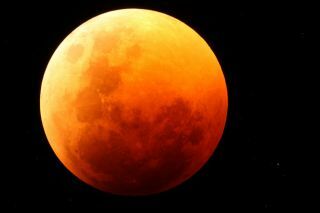 The first total lunar eclipse of 2014 will occur in the overnight hours next Monday and Tuesday (April 14 and 15), peaking at about 3 a.m. EDT (0600 GMT) on Tuesday. Weather permitting, the moon event could be a striking lunar sight. The lunar phases and how they relate to the moon's visibility offer a good astronomy exercise, especially for youngsters. In fact, few astronomical phenomena are easier to demonstrate or to grasp. All it takes is a ball and a flashlight. By shining the light on the ball, preferably a rough-textured tennis ball, and viewing it from various angles, you can simulate the complete range of waxing and waning lunar phases. If the moon is in the sky, and the ball is held next to it at arm’s length, the ball's phase will match the moon's. This is because both your artificial tennis-ball moon and the real moon are at the same angular distance from the sun as seen by the viewer. Few science demonstrations are as simple yet as profound. With a photograph or lunar map as a guide, you can easily study the moon and identify a number of its most prominent features. Through binoculars or a small telescope, you can see that the moon’s surface has mountains, plains and large hollows with ridges around them called craters. The plains, which form the dark patches, were once thought to be oceans and seas, and were given poetic names like the Sea of Serenity and the Bay of Rainbows. These names are still used, although astronomers now know that these dark areas are flat plains of lava and that there is little or no water on the moon. Editor's Note: If you snap an amazing picture of the April 15 total lunar eclipse or any other night sky view that you'd like to share for a possible story or image gallery, send photos, comments and your name and location to managing editor Tariq Malik at spacephotos@space.com. Night sky photographer VegaStar Carpentier captured this image of an airplane cruising across a 92 percent full moon over France on March 13, 2014. “A rare and precious moment,” Carpentier wrote Space.com in an email. Binoculars make the ideal starter instrument because they're so simple to use. You see the image right-side-up and in front of you. The large field of view makes it easy to find what you're pointing the binoculars at. Yet these tools reveal many sights that most folks think require a telescope — including planets and their satellites, comets, asteroids, double stars, star clusters, nebulae, galaxies, and, of course, the craters, mountains and plains on the moon. The moon shows at least as much detail in binoculars as Galileo saw with his crude telescopes. This photo of the total lunar eclipse of Dec. 20, 2010 by Jimmy Westlake shows the blue edge to Earth's shadow set against the reddened moon. 1) The moon is in fine position for evening study at this time. 2) Nearly all of the major lunar features can be seen. 3) The moon is not sufficiently bright to cause loss of detail through glare. 4) As the line of darkness, called the terminator, recedes, features near the border stand out in bold relief; the shadows become stronger, and details are more easily seen. Your first glance through binoculars will reveal the so-called seas or "maria" (plural of "mare") of the moon. Utilizing a photograph or lunar map, spend a few nights outdoors identifying various lunar landmarks, and they will soon become as familiar to you as the geography of the earth. The mountains on the moon are easier to see through a small telescope, particularly those peaks that lie along the moon's terminator. There, the light comes from the side, and the mountains cast long shadows, just as they would here on Earth in the early morning or late afternoon. That's why brightly lit lunar peaks stand out and the moon appears more rugged. When I was a teenager, I used to imagine I was an astronaut by viewing a gibbous moon at high power through my telescope, letting the satellite fill my entire field of view. I'd then put the moon just outside the field of view of the eyepiece and then allow it to majestically drift into view. To enhance the effect, I'd listen to recordings of radio communications that were made during the various Apollo missions to the moon. The effect was dramatic, especially while I viewed craters and mountains, deep in shadow, slowly glide on by. Try it for yourself. In the nights that followed, as the terminator moved on, the sun climbed higher in the sky over the region of the moon that I was watching, and the shadows grow shorter and shorter, the lofty lunar mountains seemed to melt into the landscape and almost disappear. This is why a full moon appears flat and one-dimensional — because the sun is shining on it almost directly. When the moon is midway between first quarter and full — a waxing gibbous — it is at an excellent phase and position for evening study. In binoculars or a telescope, about halfway from the center of the lunar disk to the terminator, you'll readily see the crater Copernicus, christened the "Monarch of the Moon" by English lunar mapmaker Thomas Gwyn Elger. Surrounding this crater is a ray system which resembles a gigantic splash pattern. But down near the moon's lower limb is a crater with an even more outstanding system of rays: Tycho, one of the youngest of the major lunar craters. British astronomer the Reverend Thomas William Webb poetically referred to Tycho as "the metropolitan crater of the moon." Its brilliant rays extend outward like a sunflower in all directions for many hundreds of miles. Webb claimed that it's even visible to the naked eye at full moon, something you might like to test for yourself next Monday night if you have good eyesight. In his book "Exploring the Moon through Binoculars" (McGraw-Hill, 1969), Ernest H. Cherrington Jr. says that Tycho's rays "… give the full moon the general appearance of a peeled orange, the crater marking the point where the sections meet." Observing the region near and along the terminator will reveal a host of other fascinating lunar features. And with the unaided eye, you can imagine one eye of the "man on the moon" watching back; in the nights to come, the other eye will appear, and the mouth and nose, too, as the lopsided appearance of the gibbous phase fills out ultimately to become the full moon. Everyone has seen how the moon changes from night to night, but ask the average person why this happens and the answer becomes more difficult. Even some science teachers have been guilty of not understanding why the moon shows phases. Over the years, I've met a few such instructors who absolutely insisted that the phases are caused by the Earth's shadow. That, of course, is totally wrong; the moon's interaction with the Earth's shadow is what causes a lunar eclipse, but that's another story. How bright will the eclipsed moon be? When the moon becomes totally immersed in the Earth's shadow late on Monday night and Tuesday morning, there are some things you can do to get the most out of this event. Try to estimate the overall brightness of the totally eclipsed moon on the five-point scale invented by Andre Danjon. According to this scale, L=0 is a black eclipse, with the moon more or less invisible to the eye; L=1 is a dusky gray; L=2 is deep red; L=3 is reddish-orange; and L=4 is an orange color. For the upcoming total eclipse, the lower half of the moon should appear brighter and more colorful than the upper half. Another simple, numerical scale is the Fisher scale. It doesn't involve color, but rather the visibility of surface features inside the Earth's dark shadow. Grade 2 is when you can see "spots” on the eclipsed moon with just your eyes, or the lunar seas can be readily seen through binoculars. If you need a 2- to 6-inch telescope to show detail on the eclipsed surface, then the eclipse ranks a Grade 1. And when apertures of 6 inches or more are needed, then a Grade 0 is assigned. So keep all of these things in mind when you gaze up at the moon on these upcoming nights. After all, it's not just for werewolves and lovers!